When you're crazy about curry, that's fine, but, no matter how much you love curry, you have too much of it, it takes the roof of your mouth off. God, I really miss curry. I am homeless, at the moment, as my bathroom is being completely renovated. During these four weeks I live with friends and relatives. One way of paying for a roof over my head, is by cooking. Last day of August I prepared a tasty pork curry Rogan Josh for my nephews. 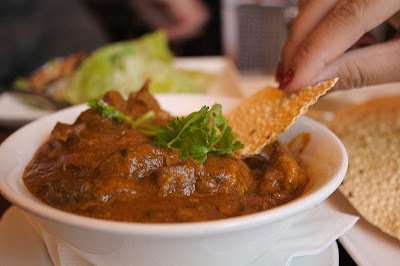 Rogan Josh originates from Kashmir, a Muslim part of India, but is popular over the whole subcontinent. I prepared this dish with pork, an ingredient that you would never find in Kashmir, but used in many other regions. This is an inexpensive meat, low in fat. I paid 47 NOK or EUR 5,90 (USD 7,50) for three boneless pork chops of 600 grams (1,3 lb's). With other ingredients and rice it filled up at least 3 hungry men.You may choose whatever vegetables you have available, but onions and garlic are natural ingredients. The pastes from Patak's are to prefer to any of the ready made sauces. The Patak's Rogan Josh paste are made from a special blend of turmeric, paprika and coriander with other spices and tomato puree. Dice the meat and then start to assemble the dish. Fry the onions and garlic in 1-2 tbsp oil until golden, then add diced peppers. Take out onions and peppers, and add 1 tbsp oil. Seal meat in two batches, then add the onions and pepper. Stir in flour and add water and stir in the Rogan Josh paste. Allow to simmer on low heat for 30 minutes with lid on. Add coconut milk and enough sweet chili to balance the salt. Then pour in coconut milk. Allow to simmer on a very low heat without lid (or else milk will separate) for a few minutes before serving.